We are delighted to announce that Tectoniks has been recognised at this year’s IStructE Regional Awards. 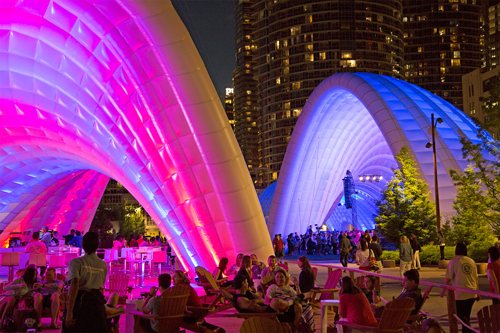 The inflatable pavilions for Ontario’s Celebration Celebration Zone won the Arts or Entertainment Structures category at the awards presented at the National Motorcycle Museum in Birmingham. The Celebration Zone was commissioned by the Government of Ontario as a key part of the 2015 Pan American Games - the world's third largest international multi-sport Games after the Summer Olympics and the Asian Games. Craig McFadyen, Chairman of IStructE Midland Counties commented: "We were very pleased to recognise Teckoniks as part of our Midlands Counties Awards, which celebrates the range of skills that characterise the structural engineering profession in the Midlands. The Ontario Celebration Zone Pavilions project is an outstanding example of structural engineering accomplishment. The project shows the diverse range of engineering skills used by the team to develop an elegant engineered solution that has exceptional architectural merit. The project was a worthy winner in what was a strongly contested awards year. Our thanks go out to all who submitted entries."